The 6 train runs between Pelham Bay Park in the Bronx and City Hall in Lower Manhattan. The route we know today went into effect in December of 1920. From north to south, it runs through Chinatown, Little Italy, Midtown, the Upper East Side, and Harlem before crossing into the South Bronx neighborhoods of Mott Haven and Port Morris. After the Hunts Point Avenue stop, it goes above ground, crosses the Bronx River and terminates at Pelham Bay Park, where you can either explore the park or catch a bus to Orchard Beach (the “Bronx Riviera”) or City Island. 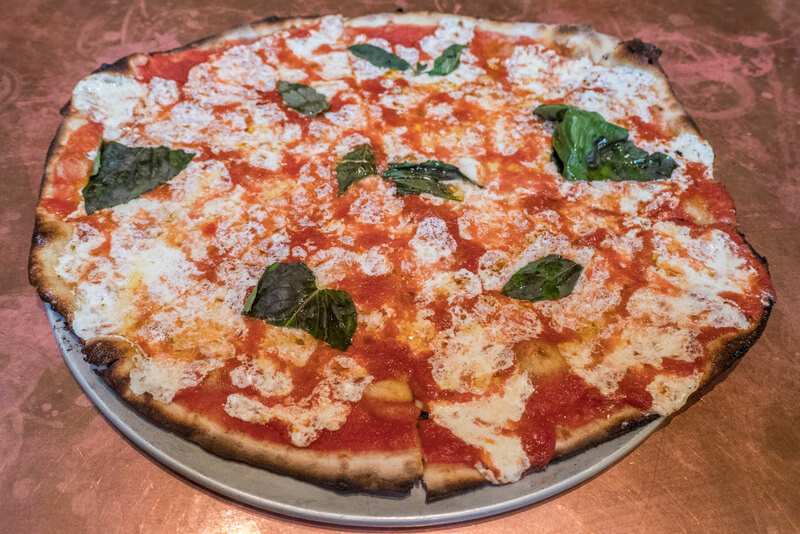 Two of NYC’s original pizzerias are easily accessible via the 6 train. 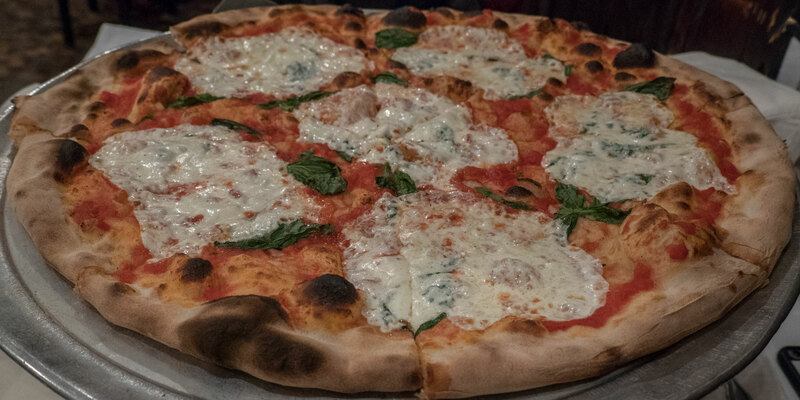 Since 2000, several Neapolitan-style pizzerias have opened all over Manhattan and the Bronx, some of which are located along the 6 train. There’s even Roman-style and star pizza in Kip’s Bay. Located in the newly revitalized Mott Haven section of the South Bronx, La Grata serves traditional Italian food in a modern setting. The restaurant opened in 2016 and is just a short walk (or one stop on the 6 train) from Manhattan. Pies come out in less than three minutes. Their Italian-made ovens can reach up to 900 degrees. The walls at Patsy’s are lined with pictures of famous guests who have dined there since they opened in 1933. They include a who’s who of athletes, entertainers, and politicians, but the Frank Sinatra portrait stands out the most. It is, after all, more than double the size of the rest. The restaurant itself is a cash-only, no-frills dining experience. It’s not difficult to imagine Frank Sinatra or Mayor LaGuardia dining there long before credit cards existed. Slices are sold to go next door, but the dining area only serves whole pies. The crust, however, is thin enough that you be able to eat a whole pie yourself. 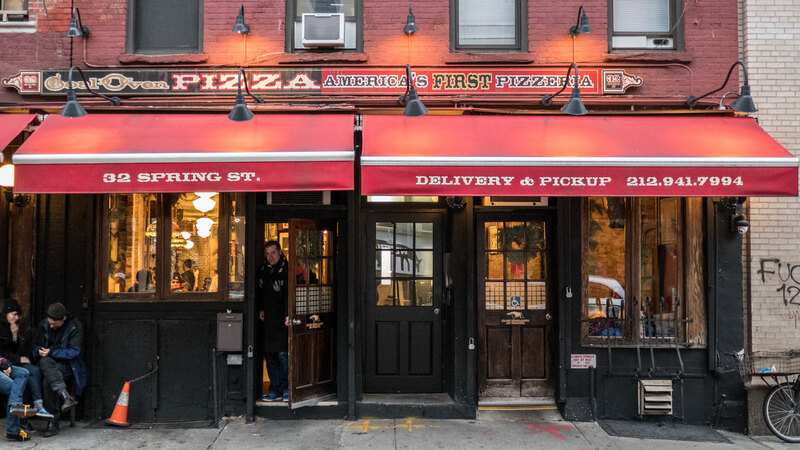 Like other classic NYC restaurants nearing their centennial, there’s a full menu, but the pizza is still the main attraction. If you don’t feel like walking from the subway station, take the M116 bus to First Avenue. Located in the upscale Redbury Hotel, Marta is far removed from old-fashioned New York City pizza joints. They specialize in Roman-style pizza, which has a cracker-thin crust. Oven temperatures range between 700 and 900 degrees. When the doors close at night, the ovens remain hot. In fact, the fires have burned since Marta opened back in 2014. Patrizia’s started out in the Bronx and now has locations in every NYC borough except for Queens. The Manhattan restaurant is located along 2nd Avenue in Kip’s Bay. All pizzas are available in a star shape including the Nutella pizza. If you’ve never mixed Nutella and mascarpone, try the Nutella pizza with mascarpone. Ribalta has the most convenient location in this list. Just a couple blocks south of Union Square (the place KRS-One raps about in “The Bridge Is Over“), Ribalta is a very short walk from seven different subway lines. If you show up during a soccer game, the staff may be a bit preoccupied, but the pizza is worth the wait. If you’re one of those people who have trouble deciding between Nutella pizza and tiramisu for dessert, try the babamisu! Their website is firstpizza.com. Lombardi’s started as a grocery store on Spring Street in 1897. In 1905, Gennaro Lombardi opened what the Pizza Hall of Fame acknowledges as the first pizzeria in the United States. They do not sell slices, and although the price of a small pie is 370 ($18.50/$0.05) times more than it was back in 1905, there is often a line around the block. Like many other classic NYC pizzerias, the walls are lined with photos of celebrities who’ve dined there over the years. Do you agree with my list? Have other suggestions? Feel free to leave a comment below! I just had a curry but now I really want some pizza as well, Martyas looks amazing but to be fair all the pizzas look amazing! This has made me want some Pizza now ?? Oh gosh, seeing this post made me crave from some pizza. Hot and fresh from the oven! It would be so nice to try these places out and if you have time it could be like a tasting tour! My kids and I adore pizza and we’re definitely going to enjoy this! Oh my goodness .. I love pizza places like these! My husband is from Chicago and whenever we go I always want to go downtown for pizza. It’s one of our favorite things to do. Thanks for bringing back some really great memories ? Good grief they all look ridiculously epic! I’d love one of these! I tried La Grata when I was in Manhattan! I liked it very much and I’ll keep this post next time I’ll go to NYC. A good Pizza is always a good shelter for an Italian girl! Glad you enjoyed it Sabrina, but La Grata is in The Bronx. They all look appetizing to me but I’d prefer to go for the one I never tasted before which is the Nutella and mascarpone, looks something else from the photo! And now I’m absolutely starving. Looks delicious! I will have to keep this in mind when I return to NYC. I have only been once for 2 days and was surprised at how different to pizza is to Europe and Australia. The NY crust is so crispy , it was delish. This post has definitely made me hungry! Your post just made me very hungry. Can’t wait to try some of these on my next trip this summer. Of course I’d go for the star shaped Nutella pizza. My ohhh my that looks good! Would love to digg my teeth into that! Oh man, I’m already starving and these pics are making it worse!! I’m gonna have to try one of these places when I go to the city in June! What a fun idea, a pizza crawl! For whatever reason that pizza from Patsy’s looks to be mouthwatering and calling my name. Thanks for sharing these fun places to find pizza in NYC. YES. I love pizza, could live on pizza. Love NYC pizza! Thanks for sharing! This is such a great and useful guide. We don’t know NYC very well. We really needed this. And those pies look irresistible. I love the star shaped pizza! Not so sure about Nutella flavour though 😉 Which place is your favourite? My favorite place is not in this list, but if I could go to one place right now, it would be Marta. With that said, I’ve been to Patsy’s the most. Have you been to any? I’m going to have to visit the Bronx and Manhattan just to get a pizza. All those photos have made me very hungry! Great pizza photography! Interesting, I never knew Lombardi’s was the first pizzeria in United States. That thought never even crossed my mind. All of these’s pizza’s look delicious! That sounds like a fun way to tour NYC. They have more of a variety of pizza styles than I expected from NYC. How does pizza in NYC compare to the rest of the world? My favorite pizzeria is in Brooklyn, but I also enjoy Giordano’s in Chicago, Grotto in Delaware, Maryland & Pennsylvania. I haven’t had bad pizza in Italy, but it’s been a long time. Sao Paulo is supposed to have some of the world’s best pizza, but I haven’t made it to Brazil yet. Drooling over that Nutella pizza! NYC really has the best pizza options in the USA! All of these look yummy. Unfortunately, in my older age I can’t eat as much pizza as I like or used to be able to as I gain weight. Sigh. But, I would totally try the Nutella pizza as I’ve never had it before. This has surely induced my pizza craving. The food looks really great NYC pizzerias are the best. The idea of a Pizza crawl is indeed tempting. Probably I will fast prior to embarking on this voyage of Pizza Discovery. I would being taking this train every day if I could stop at all these places. Pizza is seriously god sent! I can’t even remember when the last time I had pizza in NY so I need to go back soon!! Wow its lunchtime here and now all I can thin about is pizza. I love the thin base Italian ones – crispy and with plenty of cheese – these all look deliciously homemade and far from the usual pizza joint type food. I love finding authentic restaurants so thanks for the tips! I think my Italian husband would really object to Patrizia’s but you definitely make me crave for a pizza!! We haven’t been to any pizzeria while in NY so I’ll keep that list and look for any that would make me one vegan! Hi Alice. Why would he object? Wow, so many choices out there. You have some of the mouthwatering pictures here, wish we could put a hand into the machine and grab a pie :). We love cracker-thin crust pizzas they are just delicious and the star shaped pizzas at the Patrizia’s looks yummy too. Would love to try the Nutella one. No other pizzas compare to New York pizza!! That crust is to die for! Went to Lombardi’s years ago when I still lived in the city for their penny pizza day – now that was a line!! Haha. But worth it. Their pizza is great but I’m not about to pay $20 for a pie! Not sure if you noticed but did you happen to see if there were vegan cheese options at any of these places? I’ve been to a couple NYC pizzerias with a friend who is vegan. We always ordered the marinara. However, places like Paulie Gee’s offer a whole vegan section on their menu. Yeah that’s what we do too – the crust and sauce is what I’m all about! We keep hearing about Paulie Gee’s now that we’ve left NYC..will have to check it out next time for sure!! Thanks! You’re welcome. They are in Baltimore as well. Bistra, to really appreciate it, you should visit one per day or bring someone along to share and visit 2-3 per day. If you tell me the train line and/or neighborhood, I may be able to figure it out, Brianna. I just had my dinner and now after reading your post. I am craving for a pizza. Such a tempting and drool worthy post. I am a pizza fan and they all looks so tempting. I am actually craving for one after reading your post. I am curious to know if any of these places would have a dairy-free option. It’s becoming easier to find restaurants who will have cheese alternatives or nut “cheeses”, which is great for those who have dairy allergies. I wish I could indulge in one of these pizzas! Thanks god I’m italian and I can eat amazing pizzas whenever I wish 😀 . I’m really curious to try that pizzas in NYC since I use to eat pizza in every country I visit…the worst was in China (tiny and disgusting) and a part of Italy one the best in London (but italian restaurant). From the pictures “La pizza” respect the italian style, so next time I’ll visit NYC I’m going to tell you what about the flavor 🙂 . Oh my god, I literally love pizza and the nutella and mascarpone one looks AMAZING!!!! Great guide here, can’t wait to get back to NYC! HI Akmal. It’s been 11 years since my last trip to Italy. I didn’t notice a major difference between pizza in New York and (for example) Naples. I grew up in a smaller city and the pizza there was very greasy unlike what I saw anywhere in Italy. Man… i’m missing the NYC pizza scene now. Pizza here in SE Asia is so ridiculously priced and nowhere near as good (sorry, just my opinion). Wow, I really want pizza now!! What a great train route through all those foodie places. Next time I’m in NY I’ll definitely be checking some of these places out. These look absolutely delicious and what a great way to see the city. I need to make a trip in just for that nutella pizza. Wow! What a great list of Pizza spots in the NYC! All these pizzas looks incredibly delicious and I feel like having it now for a breakfast! I’d love to visit every place as mentioned by you and try their signature pizza! Ana, too bad you didn’t get to try any during your last visit. Hopefully next time! Yum! Your pizza photos make me hungry. May have to look up a couple of these when I’m in NYC! As a one living in Italy I can say that those pizzas look really great! Seem like the original Italian one! I’ll be sure to refer to this post if I ever make it to NYC and for sure I will be hitting the pizza spots! I’m more of a pasta gal myself, but these are seriously tempting. I actually couldn’t look at this post for too long because they all look so incredibly tasty. The italian food is one of the main reasons we want to go to NYC! 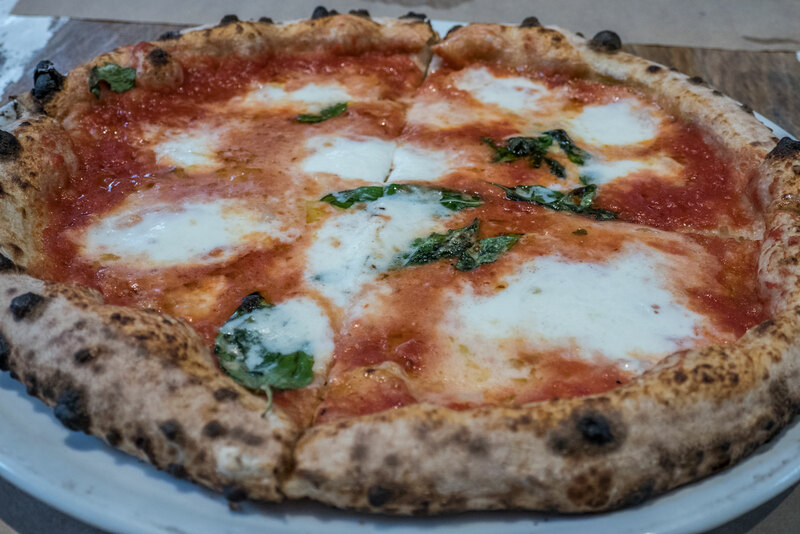 La Grata is one of my favorite Pizza places in NYC, I love that you featured it here. 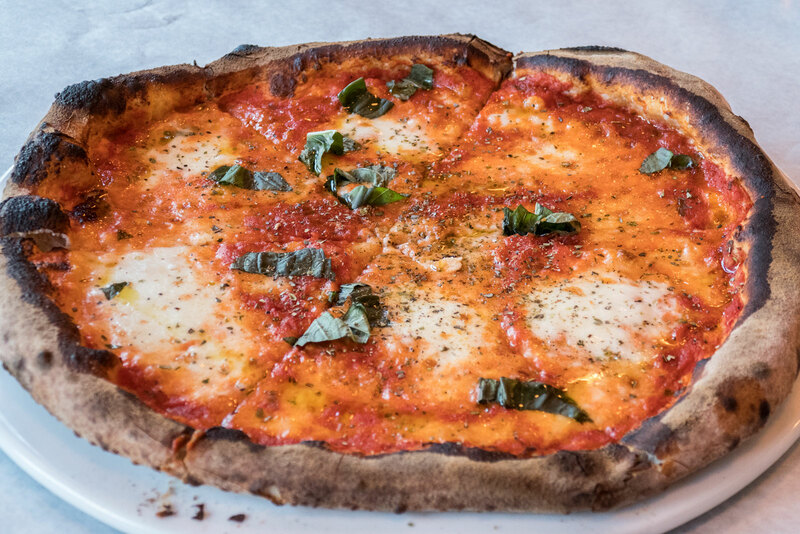 No trip to New York is complete without hitting up a local pizza place, and these other ones are going to be on my list to check out next time.